Chilli, also known as chilli pepper is a spicy fruit used in cuisine preparations. It is commonly added as an ingredient in foods to make the preparation spicy. It’s origins are traced to Mexico and it is used worldwide both as an ingredient in food preparations and medicines. Globally, China is the largest producer of chillies. As per the latest statistics, India tops the world in chilli production followed by China, Peru, Spain and Mexico. Indian chillies especially the ones grown in Guntur district of Andhra Pradesh are known for their pungency and color. Some of the big sized chillies are called bell peppers and are used as a vegetable. The most important use of chilli is in the kitchen. Owing to the presence of capsaicin, chillies have a pungent yet pleasant flavor- the main reason why it has a place of importance in the kitchen. It also is a good source of oleoresin which is a major flavoring agent in the food processing industry. Oleoresin is extracted from chillies and exported to the European countries. It is also used in skin ointments and prickly heat powders. 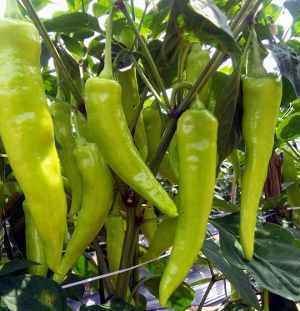 Belonging to family Solanaceae, chilli or mirchi is botanically called Capsicum annuum. It is a small, annual shrub with an erect, branched shoot. It has a tap root system with simple leaves. The flowers are small, white in color and are pendent. In other words, unlike in other plants the flowers of chilli droop down and hang like pendants. The chilli fruits also similarly hang downwards. Chilli seeds are contained within the fruit. In India chilli has various local names like lanka, mirchi etc. Chilli is a tropical and sub-tropical plant requiring a combination of warm, humid yet dry weather. During the growth stage it needs a warm and humid weather. However, a dry weather is suitable for fruit maturity. Temperature range of 20⁰-25⁰C is ideal for chilli growth. At 37⁰C or higher the fruit development is affected. Similarly in case of heavy rain the plant defoliates and starts rotting. However, in case of low moisture conditions during fruiting period the bud does not develop properly. Hence, the flower and fruit may drop off. In other words, a high temperature and relatively low humidity level would lead to deflowering and fruits if developed would be very small. Chillies need moisture for growth. It has been found that black soil which retains moisture is ideal in case they are grown as rainfed crops. Under irrigated conditions, the crop needs well-drained sandy loam with rich organic content. They can also be grown in deltaic soil under irrigated conditions. In hilly areas like Uttarakhand, soil is mixed with gravel and coarse sand before undertaking chilli cultivation. A neutral soil pH between 6.5 and 7.5 is well-suited for chilli cultivation. It cannot tolerate acidic nor alkaline soil. 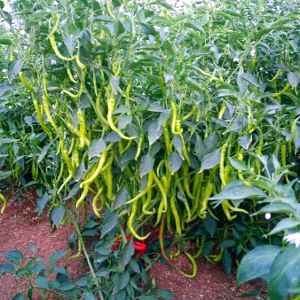 Chillies can be cultivated both as Kharif and Rabi crop. In addition they are also planted at other times. Sowing months are May to June for Kharif crop, September to October for Rabi crops. If they are planted as summer crops then January-February months are chosen. Chillies are crops that cannot withstand a lot of water. Heavy rainfall and stagnated water would result in rotting of the plants. In case of irrigated crops, watering should be only when it is necessary. A frequent watering would result in shedding of flowers and a spurt of vegetative growth. The amount of water to be irrigated, the number of irrigations and its frequency highly depends on the climatic conditions and the soil type. If the leaves start drooping during day time it is an indication of water requirement. Similarly, if the flowers seem weak or exhibit not enough vigor, irrigating the crop would help. Some farmers irrigate the field once the soil moisture content drops below 25%. Highly pungent variety with short fruits. The fruits have a light red color. They are harvested during the months from September to December. Grown in parts of Gujarat. Fruits are short with high level of pungency. Grown as a homestead crop, they are available all year round. Grown in Kerala and parts of Tamil Nadu. Fruits are fleshy, long and have a deep red color. They are harvested from November to February months. Grown in North Indian states like Jammu-Kashmir and Himachal Pradesh. Fruits are red colored and highly pungent. About 7500 tonnes of this variety are produced annually. This variety is cultivated in Indore, Chikli, Elachpur and Malkapur areas of Madhya Pradesh. Harvested from January to March. Also called G-4 this variety is grown in irrigated areas of Andhra Pradesh. The fruits are olive green which turn dark red when ripe. The variety is tolerant towards pests and diseases. Developed by TNAU, Coimbatore the fruits are 12 cm long. The raw fruits are light green in color and tapering at the tip. Moderately resistant to fruit rot. 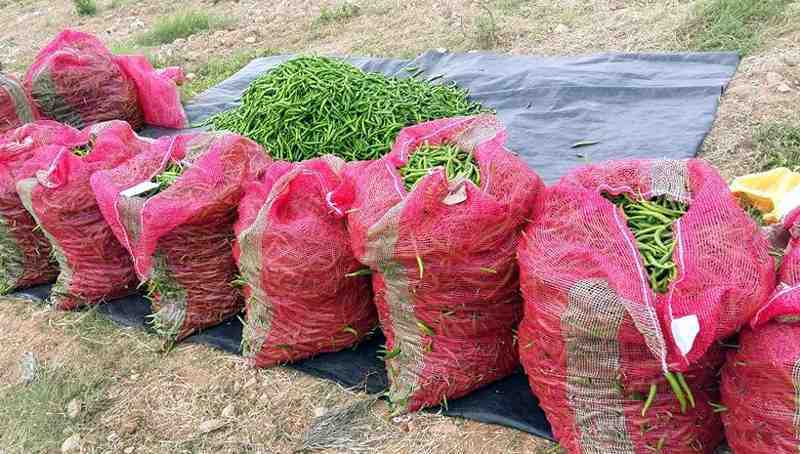 Yields 11 tonnes per acre of green chilli and 2 tonnes of dry pods per acre. 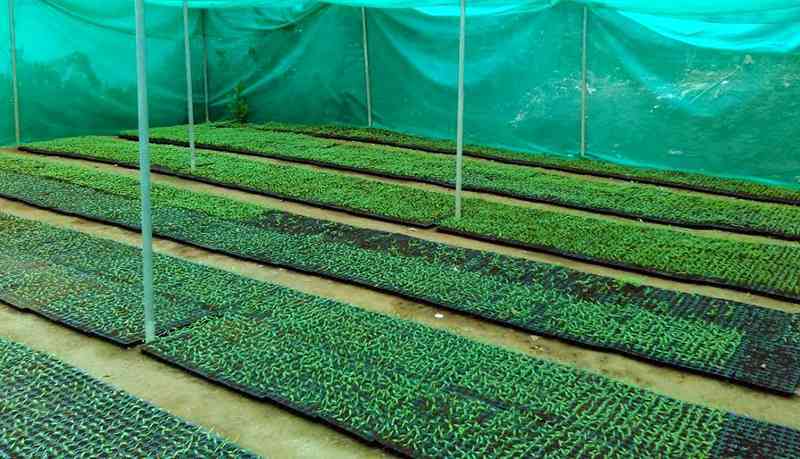 Chillies are ready for harvest within 200 days of plantation. It is developed through pure line selection from Assam typeB72A. They are suitable for cultivation in rainfed areas. Plants are tall with fruits spread out. Yields about 700 Kg of fruits per acre. This variety is a pure-line selection from Kandangadu type chillies. The fruits are medium-sized with a bulging base. The tip is blunt and the chillies appear glossy. It is most widely used for pickling purposes using buttermilk. The crops are ready for harvest within 210 days and they yield 7 tonnes per acre. The land for cultivation of chillies are ploughed 2-3 times and brought to a fine tilth. The gravel, stones and other such unwanted material present in the soil must be removed. If the seeds are being sown directly in the soil then it is carried out along with the last ploughing cycle. However, at the time of ploughing, the soil must be sterilized properly so that diseases affecting the plants are kept in check. 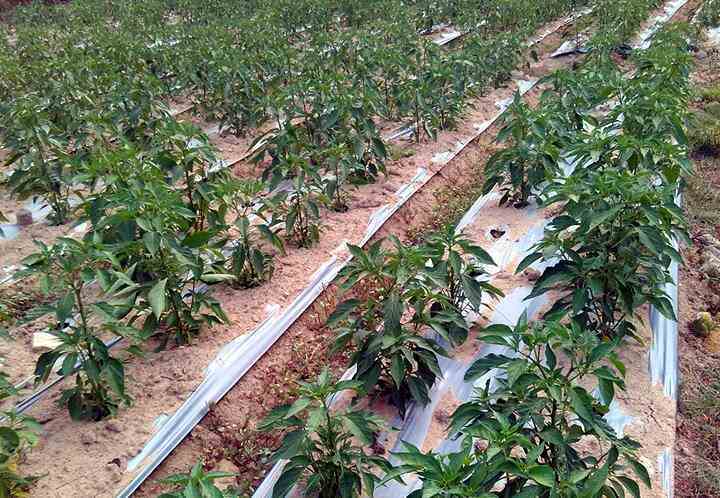 If chillies are being planted in an organic farm then the soil must be treated with Azotobacter or Azospirillum. 1 Kg of Azotobacter or Azospirillum is mixed with 50 Kg of farm yard manure. In addition, 2 tonnes of vermicompost is added on per acre basis. In case of conventional farming, soil sterilization is carried out using formalin. 20 mL of formalin is mixed with a liter of water before applying directly on soil. After application, it is covered with polyethylene sheet of 25 micron thickness for 1-1.5 days. Then they are aerated for 15 days. During the last ploughing, 8-10 Aldrin per acre is applied to the soil. This ensures protection from pests like white ants. Post the soil treatment, ridges and furrows are dug with a spacing of 60 x 45 cm for varieties and 75 x 60 cm for hybrids are maintained. In case of raised beds they are built at a distance of 30 cm from each other and are 120 cm wide. This is one of the initial steps on sowing. The chilli seeds are never pre-treated with chemicals. Instead they are treated with herbal fungicides. 80 grams of seeds are required for sowing in one acre of land. The seeds are treated with Pseudomonas fluorescens (10 grams per Kg of seeds). It is a bio-fungicide which protects the disease from fungal attacks and pests. The seeds are then mixed with Azospirillum (200 grams per Kg) and shade dried for half hour. Chilli seeds are commonly grown in nurseries and the seedlings are transplanted. After sowing the seeds are covered with coco peat and watered everyday till it germinates. 3% Panchagavya spray is done after 15 days or a micronutrient spray is done after 18 days. The seedlings are transplanted once they are 35 days old. The seedlings are dipped in 0.5% Pseudomonas fluorescens solution for half an hour and then transplanted in the main field. The intercrop distance is maintained at 45 cm during plantation. 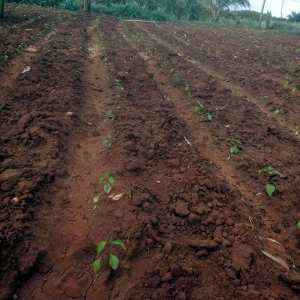 Chillies are intercropped at some places with onions in paired rows. In other words, two rows of chillies are followed by one row of onion. This ensures weed control. It also serves as an additional income to farmers. Chillies suffer from a variety of diseases like anthracnose, fruit rot, dieback, bacterial wilt, mosaic diseases, powdery mildew, leaf spot, etc. The best way to check the development and spread is to use resistant strains for sowing and conduct regular manual inspection. The affected plants must be removed immediately as soon as the disease is detected. In addition, spraying Trichoderma and Pseudomonas species would help prevent disease spread. Thrips, pod borers, grubs, nematodes, aphids, mites, etc. are the major pests of chilli farming. It must be ensured that at the time of farm yard manure application only well-rotted manure is sued. Intercropping with onions would help prevent pest attack. 100 Kg neem cake per acre helps keep root grubs away. Some farmers keep grasses in heaps at designated spots on the field. Grubs gather in these heaps and the heap is burnt in the morning. This way, the life cycle is disturbed and likely grubs are destroyed. Neem Seed Kernel Extract is applied for controlling thrips and mites. Similarly, installing pheromone traps help control fruit borers. According to the variety, climatic conditions, soil and growth conditions, fresh chilli yield varies from 30-40 quintal per acre. 25-35 Kg of dried chilli is obtained out of total 100 Kg of fresh chilli. Dry chilli average yield varies from 7.5 to 10 quintals per acre. Chilli harvesting is done according to the intended use of chillies. For making chilli powders and dry chilli, the fruits are harvested when the chilli turns dark red in color. The green fruit is plucked for preparing chilli pickles. However, ripe fruits must be plucked at regular intervals. Retaining them in the plant for a longer period of time can cause color fading and wrinkles. Green chillies can be plucked 8-10 times while ripe ones are plucked 5-6 times.